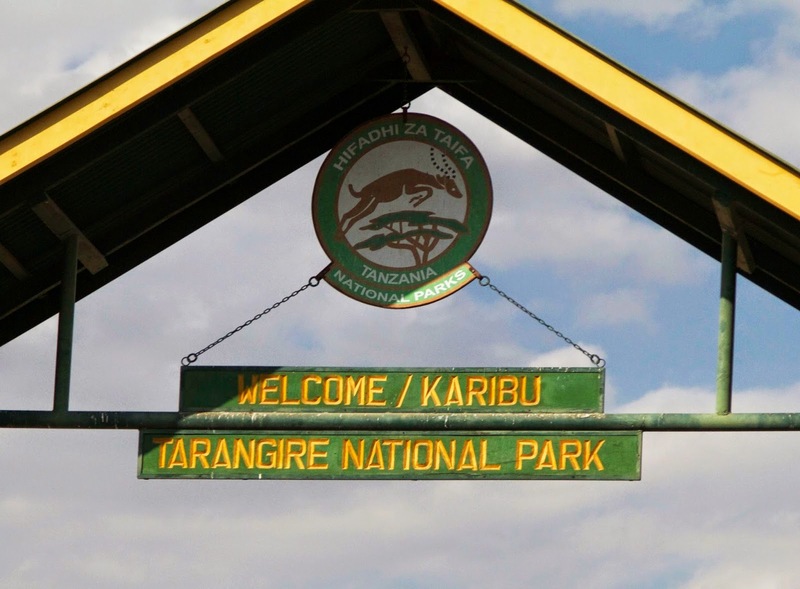 Tarangire National Park is not as well known as it's cousin the Serengeti, nor is it as large. But it's got one thing that most of the parks in the area don't: year-round water. The Tarangire River winds it's way through the park. 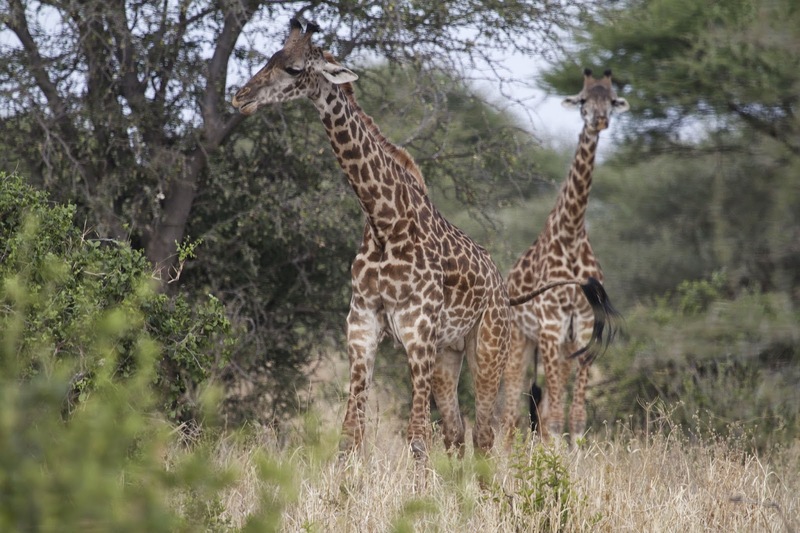 Located 150 kilometers southwest of Arusha, Tarangire is home to a huge variety of animals, not the least of which are the large herds of elephants. 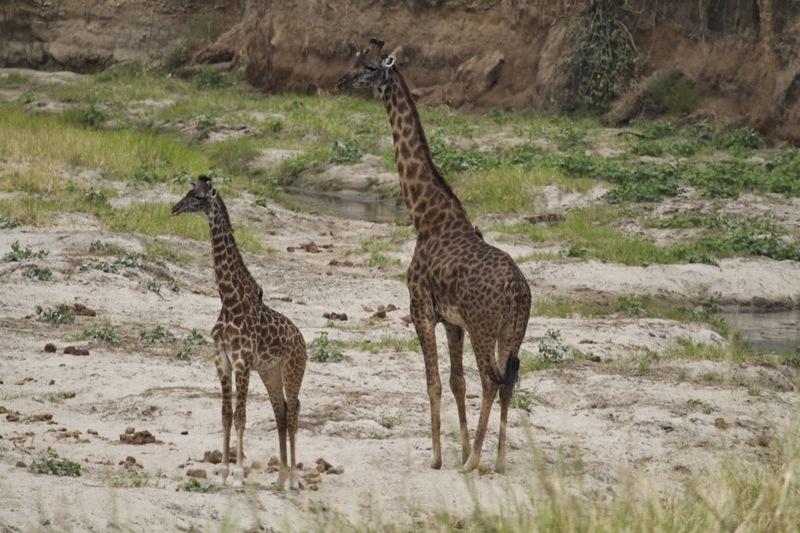 Named for the river that runs through it, Tarangire attracts lions, zebra, wildebeest and baboon in addition to the elephant, along with a host of migratory birds. It was the first stop on our itinerary, and we could have stayed an entire week and not seen the whole park. It's that big. 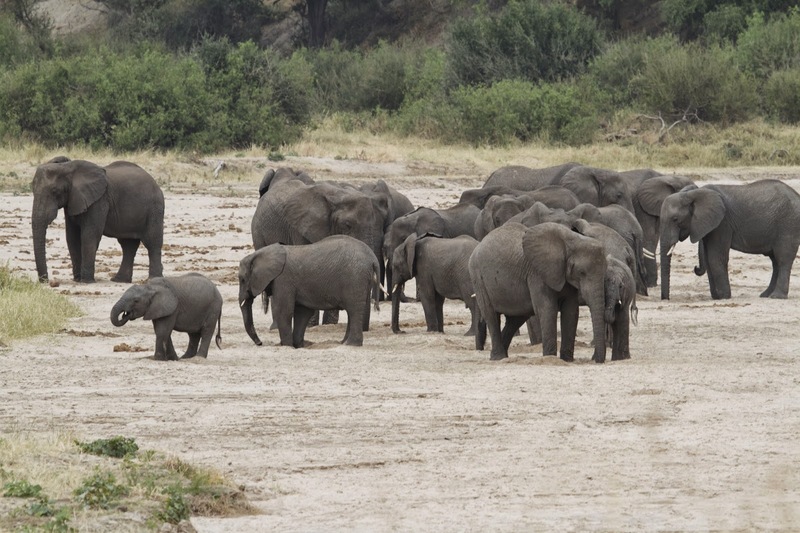 A herd of elephant dig for water in the riverbed, Tarangire National Park. We cruised in on our first day, frazzled from jet lag and that disconnected feeling you get when dropped into a new country. This was our first introduction to navigating in Africa with it's absence of road signs, pavement or mile markers so the trip had been a little stressful. We pulled into the gravel lot, taking the hint from the chain across the entrance that we needed to check in before we could proceed. There was an entrance station on the road, but first we had to stop in at the visitor's desk and pay our fees. This was where we were introduced to The Log Book. Every park had at least two log books at the gate; some had even more. It's a huge leather-bound ledger with columns marked for various information: name, country of origin, vehicle plate number, etc. The person in charge of taking our fees had one, and there was a duplicate one outside the window which we were expected to fill out. As far as we could tell, they were exactly the same. 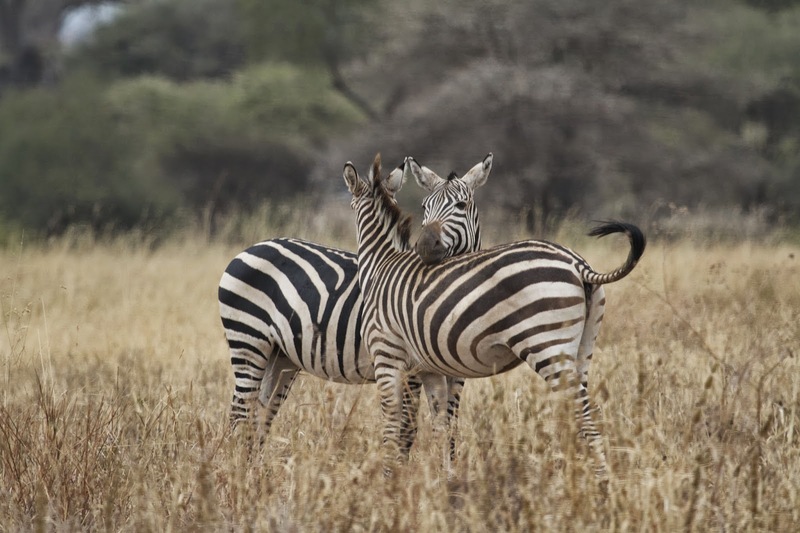 Time and again we saw this: zebra resting their heads on each other's back. With the absence of reliable electricity at many of the places we visited, I wasn't surprised the parks weren't computerized. I suppose the duplication was a safeguard against unscrupulous park workers that might pocket the money otherwise. But it got to be a running joke between Mark and I when time after time, gate after gate, we had to fill in the columns with the exact same information as the park official was doing on his side of the table. Once we paid and were given a receipt we proceeded to the gate, where we parked again and showed our receipt to the guard, filled out another log book (as the guard filled in his matching one) and finally the chain came down. 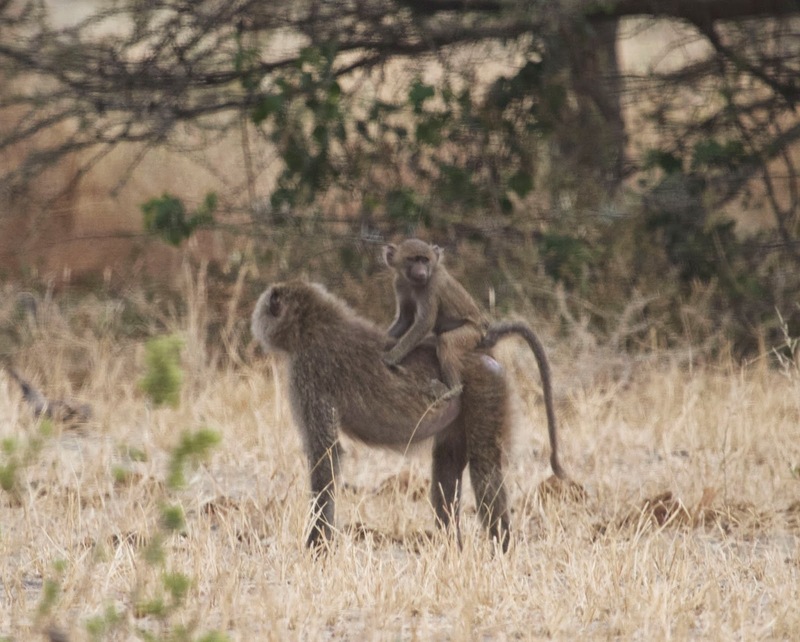 Aside from the baboon we saw working the lines of safari vehicles in the parking lot, we hadn't seen any wild animals on our way in. Within two minutes that changed. 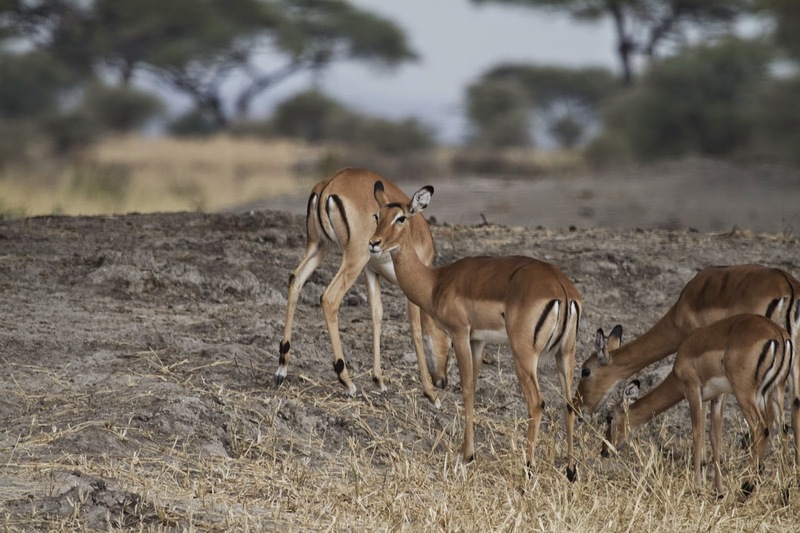 Impala graze by the side of the road, with warthogs and wildebeest for companions. 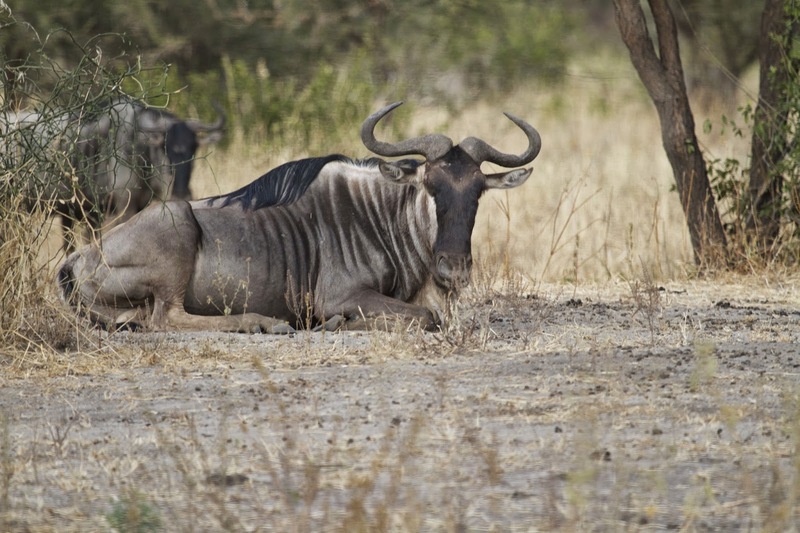 A wildebeest (or gnu) rests under a tree. Two giraffe wonder what to make of our noisy bright yellow car. 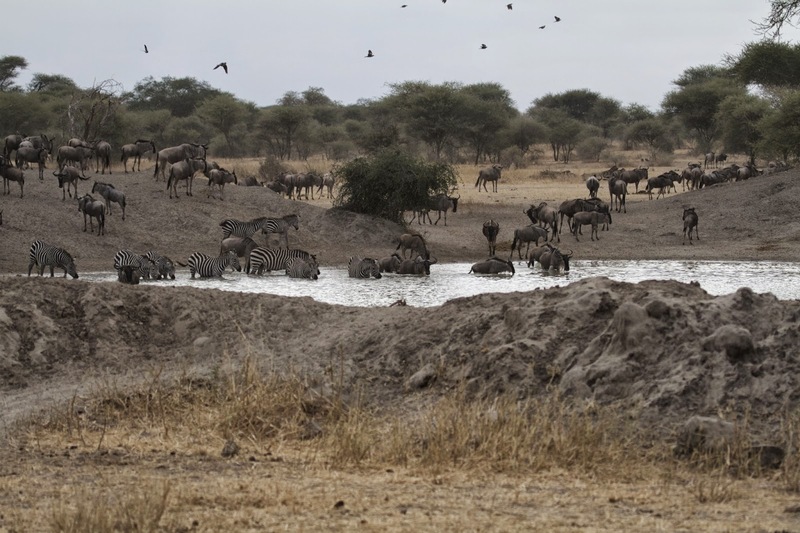 Herds of zebra and wildebeest were grazing in the dry grasses. 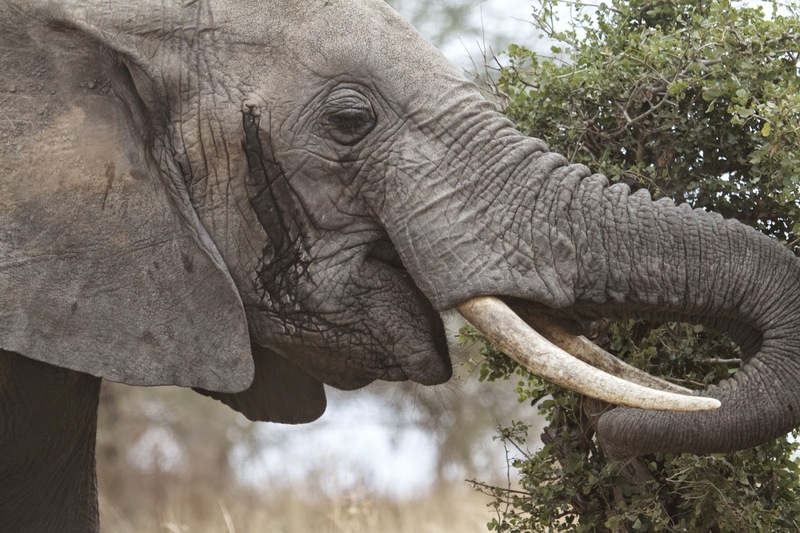 An elephant appeared between two trees, staring at us as we idled by. Gazelle would hear our engine and look up, their tails wagging as if they were happy to see us (they weren't, but it was nice to think so.) It felt like we had just driven into an episode of Mutual of Omaha's Wild Kingdom. 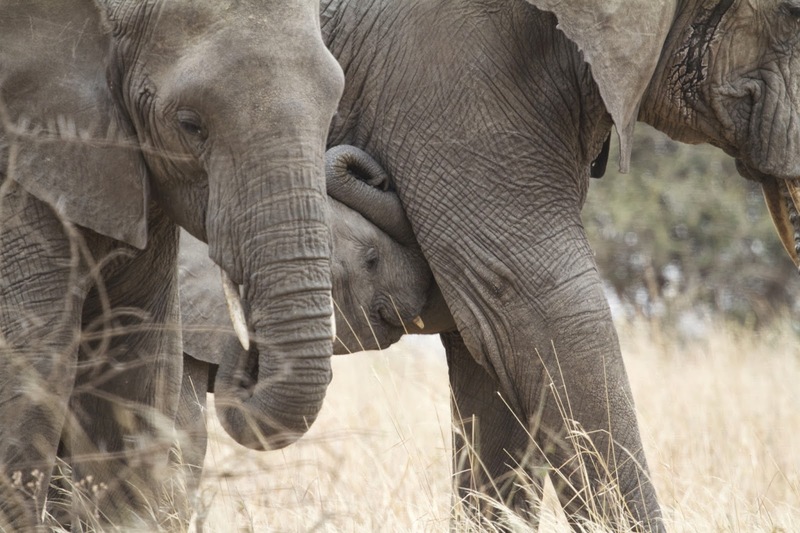 A baby hitches a ride on mama's back. 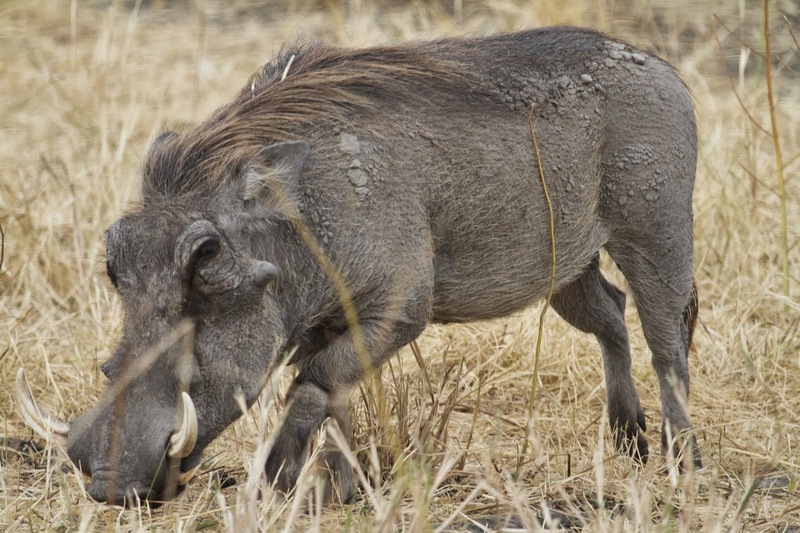 Maybe they aren't the best looking of the bunch, but warthogs are the most entertaining animal in Africa. 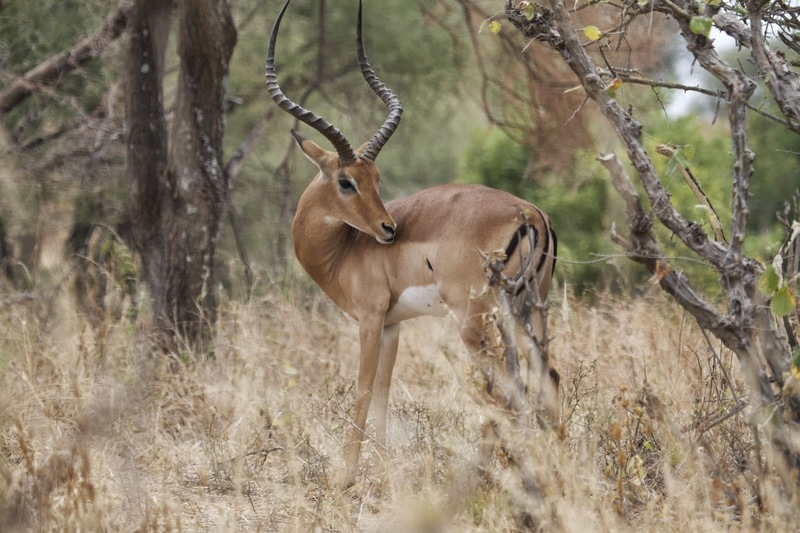 An impala keeps an eye on us. 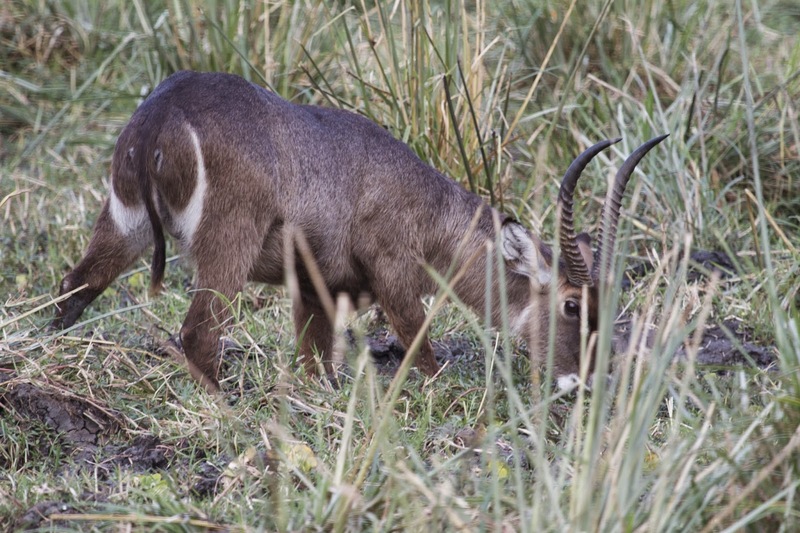 A waterbuck grabs a snack in the still-green grasses by the river. Snacking is a full time job when you're this big. Hey! Look what I found! 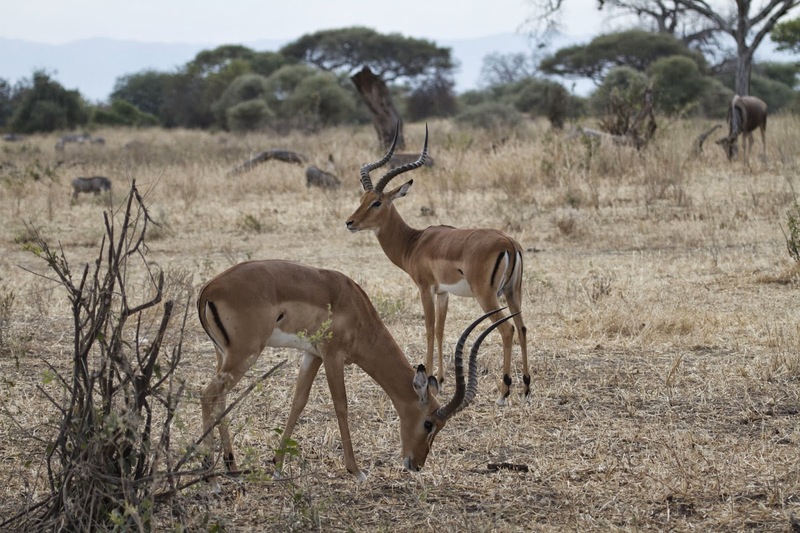 Impala travel in large groups, always on the alert. Our first challenge was finding the public campground. It was hard to concentrate with all the animals distracting us; we must have taken a hundred photos before we figured out where we were on the map. Roads in this park seemed to meander around; the main ones were marked (most of the time) but we were never sure if the smaller side roads were there intentionally or just tracks made by an over eager safari driver chasing a photo op. 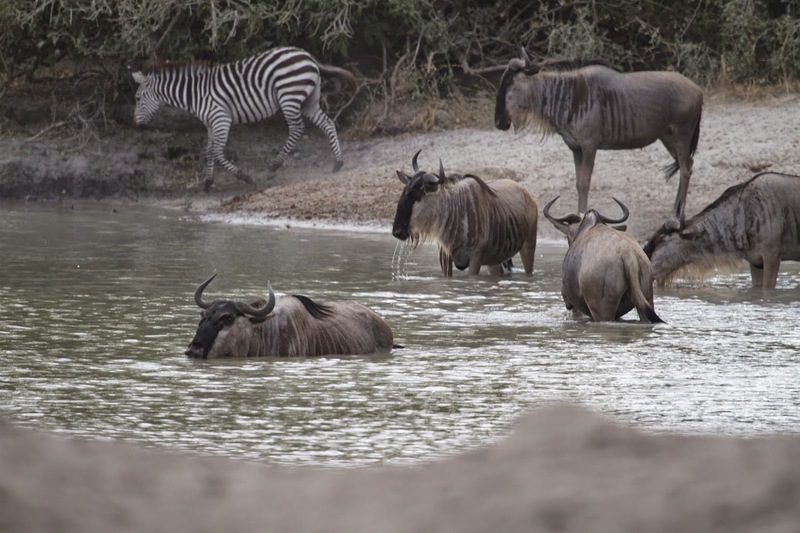 A waterhole provides not only drinking water but a bathing opportunity for these gnu and zebra. July is the middle of dry season in Tanzania, so the grasses were golden and the roads dusty. 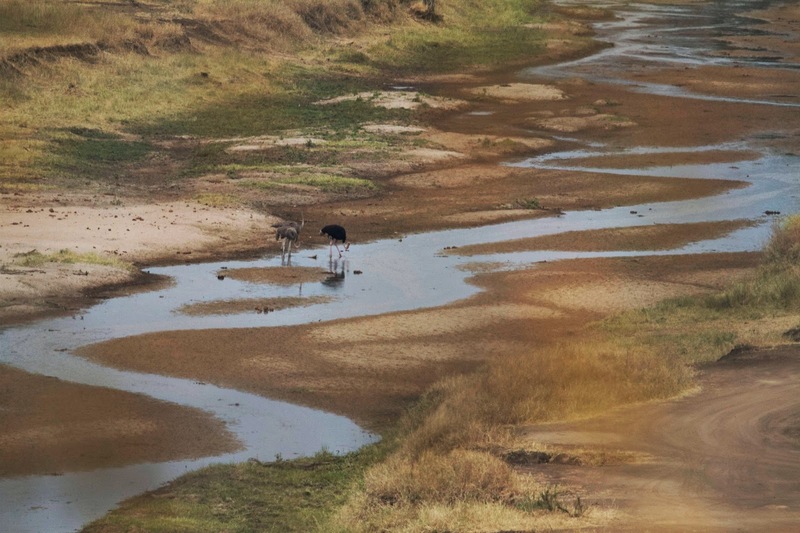 Even so, there was still water in the river, and watering holes here and there were crowded with animals getting a drink. 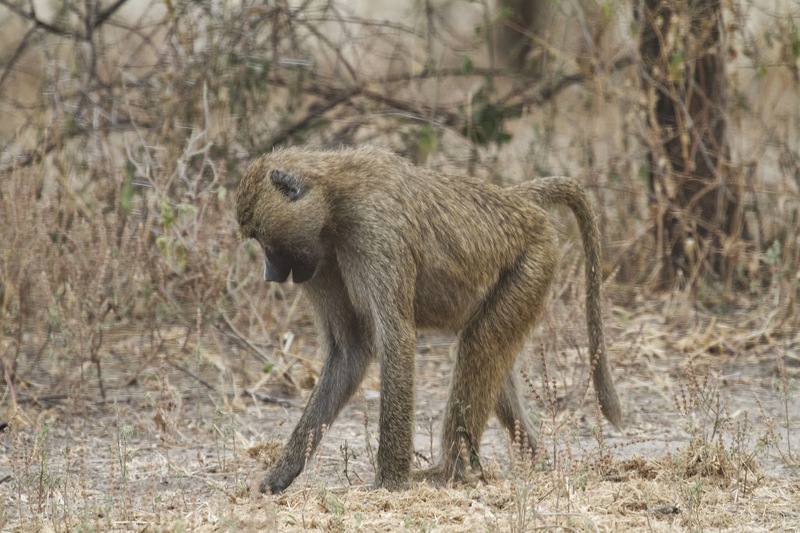 We had chosen this time of year on purpose, as the muddy roads in some places become impassable during the wet season. 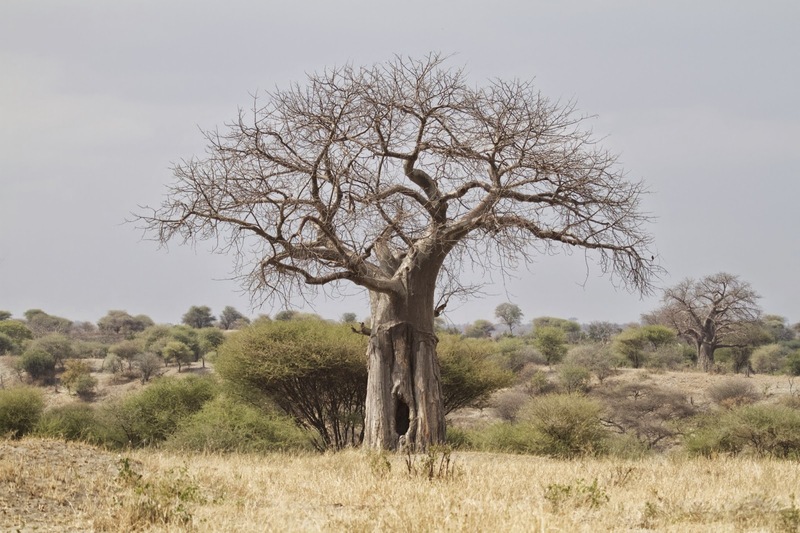 A baobab tree stands in the savannah. 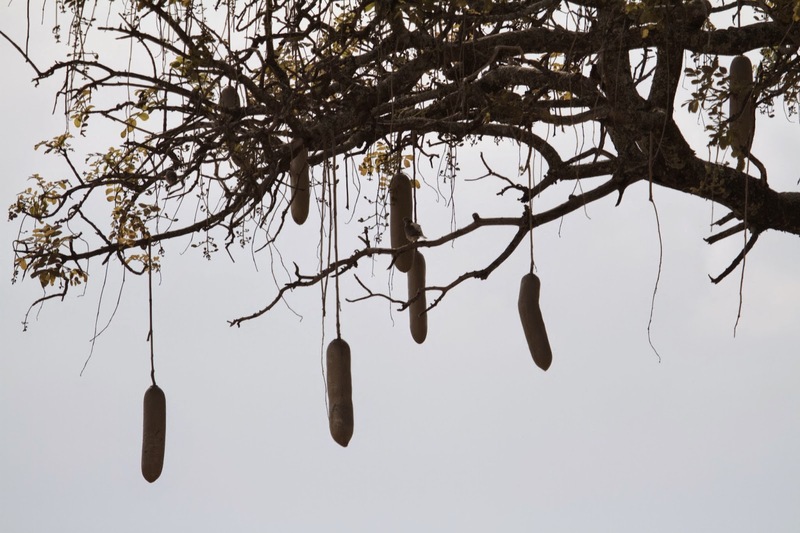 The curious Sausage Tree has huge seed pods that hang from it's branches. 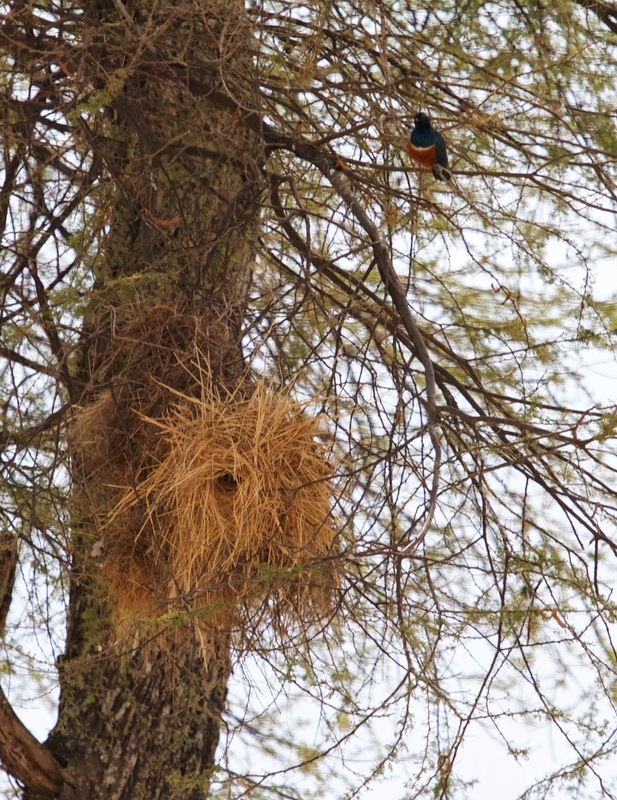 we saw hanging from tree branches. A scene from the waterhole; another Mutual of Omaha moment. 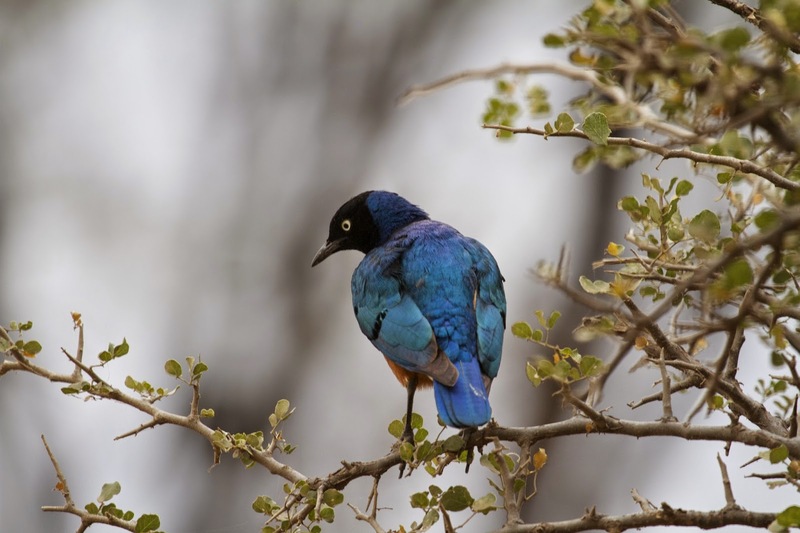 We didn't know it yet, but this turned out to be our favorite park for viewing wildlife; relatively uncrowded, it was packed with large herds of animals as well as interesting trees and loads of birds. Unfortunately we only saw one lion just as it disappeared into the tall grass, but the park paid off with it's huge herds of elephants roaming everywhere we turned. 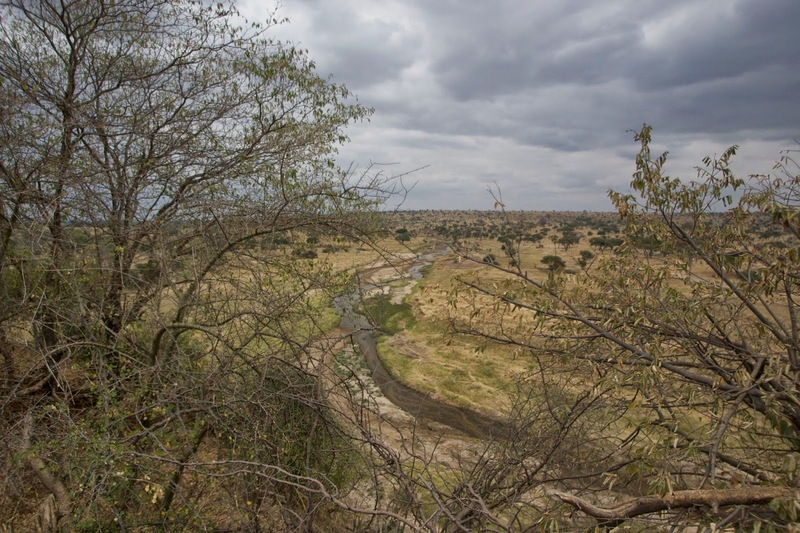 The river cut through the savannah making for great photo opportunities of both the animals and landscape. 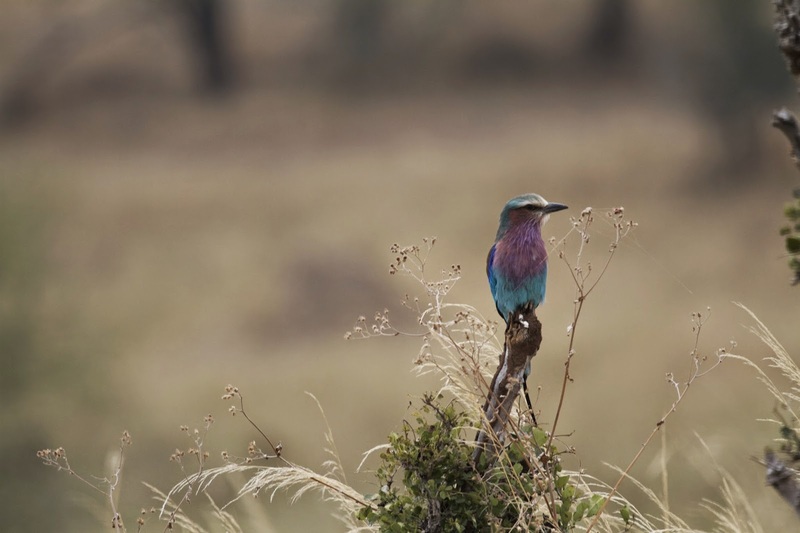 When we go back to Tanzania, we are definitely returning to Tarangire to explore more of this wonderful park. 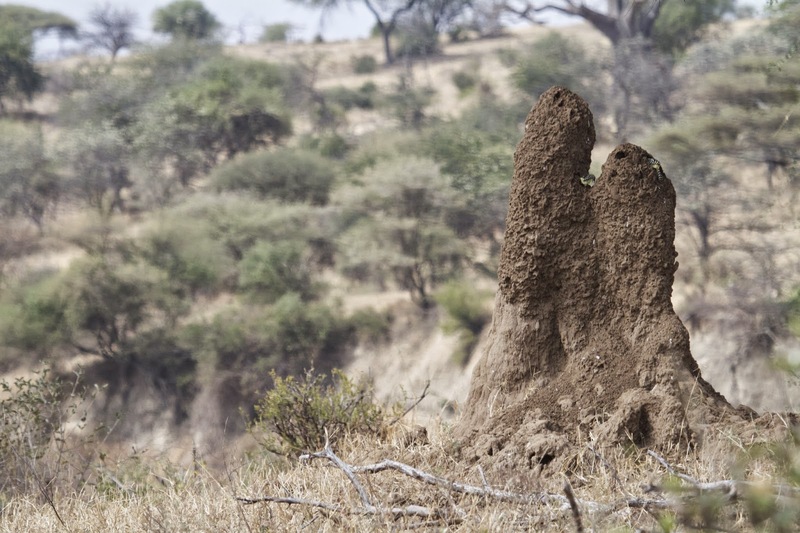 A termite mound stands vigil on the hills of Tarangire National Park.